Designs by Lisa Somerville: Blog Candy - TJ CD#6 and a Sneak Peek! Blog Candy - TJ CD#6 and a Sneak Peek! What better to offer as Blog Candy than the latest CD from Technique Junkies! I use techniques from the newsletter on just about every card I make. The technique I seem to use the most lately is Marker Water Coloring - and if you win my Blog Candy - you'll find this technique on the CD. Simply leave a comment on this blog post telling me what your favorite technique is by 11:59 CST on Sunday, September 28th. When you leave your comment, be sure to put your NAME in the comment -- if you enter your comment as "Anonymous", I cannot give you the prize as Blogger does not record your email address for me. You'll need to check back to find out if you have won or include your email address in your comment so that I can notify you. I will have a random number generator pick one number from the comments to select the winner of the 6th Edition TJNL CD, and post the winner on Monday. Please remember only 1 entry per person. 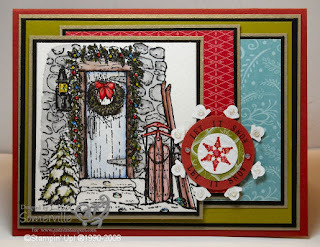 The Sneak Peek I have to share is the stamp set (Home for the Christmas) and the DSP (Ski Slope). Both of these products will be in the Holiday Mini Catalog, available for order via my website on October 1. I used SCS Sketch 195 for my layout. The sentiment Let It Snow was stamped with my JustRite C-30 Stamper and the Small Letter Set. The snowflake from Snow Burst is stamped in Riding Hood Red on white card stock, then covered with Stickles, layered on a piece of Bella Rose DSP. The white snowflake was cut with my Snowflake Sizzlet and Big Shot, I added some Stickles to the snowflake for a bit of shimmer. My main image is from Home for Christmas, it's stamped on watercolor paper with black ink, colored using the Marker Water Coloring Technique. I added some Stickles throughout the image for some added sparkle. The DSP layers are from Ski Slope. Happy Wednesday and Good Luck! I can't believe I am first to post here. My favorite technique is Faux Dry Embossing. You have posted some pretty examples of this technique. I do, however, have all the recent newsletters. Are some (or all) of these techniques also in the CD? Is there a list of all the techs available anywhere so that I can choose my fave? Thanks for your help and for offering such a neat prize!! How cool! Well, I am a TJer and I love many of the techniques, but I'd have to say PE Gloss is one of my faves. The results are just too gorgeous! Thanks for the opportunity to win - I didn't get my CD this year and I'd LOVE to see it!!! Oh, and the stamps look like they are to DIE for!! What a wonderful giveaway! My favorite technique is fossil stone - quick, fun to do, and I love the varied results you can achieve! My favorite technique is the Emerging Color technique. How beautiful!!! I like embossing the best. Seems to add just the right amt. of elegance to a design. Thanks for the chance to get this CD--I love the techniques. I try all techniques but I keep going back to 'Polished Stone'. It's my all time favourite. I don't have the new CD but I did try the 'Waxy Folder' and enjoyed this technique. i use the marker water color all of the time....but my new favorite is bandana. cool, easy technique! LOVE your card; just beautiful! I'm a TJ member but don't own any of Pat's CD's ... would love one ... or six! Omigosh, ONE favorite technique?!? Ouch, hard to pick just one ... I guess the one I use the most is the Magic coloring technique using Prisma pencils and Gamsol ... but I haven't met a technique I don't like, LOL! Thanks for the chance to win; you rock! Lisa, your card is so beautiful. I haven't yet tried that technique. Currently, my favorite technique is Shimmering Resist. Please enter me by 11:59 est, sunday, Sept. 28. I just love this card with the beautiful colors. My favorite technique (but all are my favorite) is the ripped mosaic. I really need to get that CD. I have been a techJunkie for many years and love almost all of the techs I've tried. One of my all-time favorites is Expressionistic Watercolors from Dec. 2004 issue. Isn't TJ just great!! As to my favorite technique, golly, I think it's whichever one I'm doing at the moment!! Lately it's the waxy cuttlebug. And your Christmas card is just lovely! Love to be included in your drawing! One of my favorites is the old polished stone technique. I love the look of this so much that I use it frequently. I also like using colored pencils with gamsol. I would really like to win the latest Technique Junkie CD, please pick me! Thanks for the chance. Thanks for the shot at the blog candy. I love your blog and check in every day! I can't remember the name of my fav technique (duh!) but it's the one where you ink the inside of your embossing folder and then emboss - you can some really cool effects with that one! OMGosh this is some awesome candy. My favorite technique is any kind of embossing. I just love how it looks and how it gives texture on a project. Pick ME ME ME!! I would love to learn all the awesome techniques that I see on Pat's blog. Thanks for a chance. I get so much inspiration from your blog! Thanks for getiing my creative juices flowing! Right now I am loving the Bandanna technique, but the marker watercoloring is beautiful for example in the hot pepper card you did using the "I Brake for Stamps" chili peppere. I could feel the warmth through my monitor!!! Hard to believe Fall is here and soon there will be frost on the ground! If I should win the TJ cd, I could use it to stay creative and inspired through the winter. Gosh...TJ CD and Lisa's blog..how could I fail!! Thanks again for the wonderful artwork!! Wow,Lisa, great card...so many layers! My fav technique is any type of water coloring. I like to see how different people can color the same image and have it be dramatic or whimsical just by how they color it. Thanks SO much for all your sharing! I love all your cards, and enjoy looking around in all the areas on your blog. My favorite technique is probably embossing. You can do so many different things if you emboss the image first, plus they look great just embossed. Thanks for sharing. I love your card! Please enter me to win- I do not have the CD yet...... I would have a really hard time picking just one- I have a favorite from each newsletter! Some are more challenging too, so although I like them, I do not want to do them...... Today, it is Painted Pigments, yesterday it was Bandana....... Thanks for your inspiration (dailt I may add).....!!! I have been doing marker watercoloring alot lately and really like that technique right now. I would love to win this CD! Thanks for the opportunity to win this great blog candy! I guess my current favorite would be the bandana technique although I have lots of faves. I'll have to go with polished stone too... altho there is another I love but cannot think of the name. Drat. It's all amazing! My favorite technique is watercoloring. I seem to do it a lot. I love the bold colors of Createx Creations but I'm crazy about all the TJ techniques! ;-) I've ordered CD6 but I'm sure I have a stamping friend who would love the CD as a gift if I win. Thanks for the chance! Lovely card! My current favorite technique is the Bandana. Hi Lisa~ That card is absolutely gorgeous!!! The technique I use most is the polished stone one. I love the effects it gives and always loooks pretty! Oh, Lisa! this is GORGEOUS!!!!! MY fav is watercoloring, though I am not that good at it, practice makes perfect right? I hope so, as I need to get better! Thanks for the chance to win...and your bard is beautiful! This card is gorgeous. I love watercoloring cards. This card shows the beauty of the technique. my favorite is using just rubberstamps as a background alot. sometimes that is what is most handy and you can do alot with just a rubberstamp,heat emboss,use paint,inks,watermark,ETC. so many different ways that one need to just think I have my stamps. I'm a TJer but don't have any CD's. Would love to win this. Blog Candy...how cool! My favorite technique is ghosting as I like the holographic look of it! However, as with people, all are favorites at the moment I am talking about them! LOL! Beautiful card! I think I need to add that set to my wishlist. My favorite technique is the Magic Color Pencil Technique aka: Gamsol Magic. I'm not a TJ and I don't really have much experience with different techniques. So I'd really love to win this CD! I like the vibrant look of the Alcohol Ink Painting technique, though.